Parts were strewn by the Consolidated B-24D Liberator Lady Be Good as it skidded to a halt amid the otherwise empty Libyan desert. Engines 1, 2 and 3 visible in the photograph had their propellers feathered. The crew of Lady Be Good. Left to right: Hatton, Toner, Hays, Woravka, Ripslinger, LaMotte, Shelley, Moore, Adams. Lady Be Good is a USAAF B-24D Liberator that disappeared without a trace on its first combat mission during World War II. 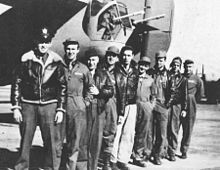 The plane, which was from 376th Bomb Group, was believed to have been lost—with its nine-man crew—in the Mediterranean Sea while returning to its base in Libya following a bombing raid on Naples on April 4, 1943. However, the wreck was accidentally discovered 710 km (440 mi) inland in the Libyan Desert by an oil exploration team from British Petroleum on November 9, 1958. Investigations concluded that the first-time (all new) crew failed to realize they had overflown their air base in a sandstorm. After continuing to fly south into the desert for many hours, the crew bailed out when the plane's fuel ran out. The survivors then died in the desert trying to walk to safety. All but one of the crew's remains were recovered between February and August 1960. 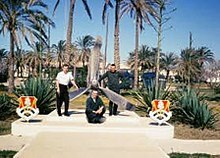 The wreckage of the Lady Be Good was taken to a Libyan Air Force base after being removed from the crash site in August 1994. In 1943, the Lady Be Good was a new Liberator bomber that had just been assigned to the 514th Bomb Squadron on March 25. 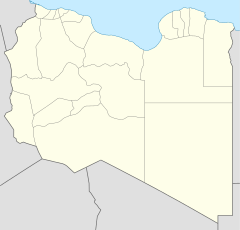 The squadron was part of the 376th Bombardment Group (Heavy) based at Soluch Field in Soluch in Libya. The plane, which had the AAF serial number 41-24301, had the group identification number 64 stencil-painted on its nose. Its given name, Lady Be Good, was hand-painted on the starboard, front side of the forward fuselage. The plane, which was one of the last to depart, took off from Soluch Field near Benghazi not long after 3 pm. Almost immediately, high winds and obscured visibility prevented it from joining the main bomber formation so it continued the mission on its own. The sandstorm led to nine B-24s returning to Soluch leaving four aircraft to continue the operation. But when the Lady Be Good arrived over Naples at 7:50pm at 7,600 m (24,900 ft), poor visibility was obscuring the primary target. 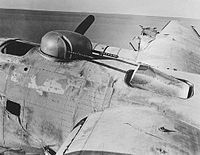 Two B-24s attacked their secondary target on the return trip while the other two aircraft dumped their bombs into the Mediterranean to reduce weight and save fuel. Lady Be Good flew back alone from Italy on its return trip to its home base in Libya. At 12:12 a.m. the pilot, Lt. Hatton, radioed to say his automatic direction finder was not working and asked for a location of base. The plane apparently overflew its base, failing to see the flares fired to attract its attention. It continued into the interior of North Africa deeper into the Sahara desert for the next two hours. At 2 a.m. the crew parachuted to the ground as the abandoned Lady Be Good flew a further 26 km (16 mi) before it crash-landed into the Calanshio Sand Sea. A subsequent search and rescue mission from Soluch Air Base failed to find any trace of the aircraft or its crew. The disappearance of the Lady Be Good became a mystery. After the crew abandoned the aircraft, it continued flying southward. The mostly intact wreckage, and evidence showing that one engine was still operating at the time of impact, suggests the aircraft gradually lost altitude in a very shallow descent, reached the flat, open desert floor, and landed on its belly. On February 27, 1959, British oil surveyor Gordon Bowerman and British geologists Donald Sheridan and John Martin spotted the wreckage near 26°42′45.7″N 24°01′27″E﻿ / ﻿26.712694°N 24.02417°E﻿ / 26.712694; 24.02417, 710 km (440 mi) southeast of Soluch, following up the first sighting from the air on May 16, 1958, by the crew of a Silver City Airways Dakota, piloted by Captain Allan Frost, and another on June 15. A recovery team made initial trips from Wheelus Air Base to the crash site on May 26, 1959. Although the plane was broken into two pieces, it was immaculately preserved, with functioning machine guns, a working radio, and some supplies of food and water. A thermos of tea was found to be drinkable. No human remains were found on board the aircraft nor in the surrounding crash site, nor were parachutes found. Evidence aboard the plane indicated that the men had bailed out. Records in the log of navigator Lieutenant Hays, who was on his very first combat mission, ended at Naples. In February 1960, the United States Army conducted a formal search of the area for the remains of the crew. Five were found (Hatton, Toner, Hays, LaMotte and Adams) on February 11. The team concluded that other bodies were likely buried beneath sand dunes after finding evidence that at least three of the surviving crew members had continued walking northward. With the news that five bodies had been recovered, the U.S. Air Force and U.S. Army started an expanded search called Operation Climax in May 1960. The joint operation used a USAF C-130 cargo plane and two Army Bell H-13 helicopters. The next body was found by a British Petroleum exploration crew. They found the remains of Staff Sergeant Shelley on May 12, 1960, 38 km (24 mi) northwest of the recovered five bodies. A U.S. helicopter found Technical Sergeant Ripslinger on May 17, 1960. His remains were located 42 km (26 mi) northwest of Shelley over 320 km (200 mi) from the crash site but still 160 km (99 mi) from Soluch airbase. These two bodies were the only ones found during Operation Climax. Another British Petroleum oil exploration crew discovered the remains of 2nd Lieutenant Woravka in August 1960. His body was then recovered by the U.S. Air Force. The only crewman not to be found was the last gunner, Staff Sergeant Moore. A diary recovered from the pocket of co-pilot Robert Toner recorded the crew's suffering on the walk northward. It indicated none of the men were aware they had been flying over land when they bailed out or were 400 miles (640 km) inland. :p.31 Speculation concludes the empty desert floor in the darkness may have appeared like open sea. The eight surviving crew members walked north because they believed they were fairly close to the Mediterranean coast. As they walked, the group left behind footwear, parachute scraps, Mae West vests and other items as markers to show searchers their path. The diary also says the group survived for eight days in the desert with only a single canteen of water to share. After walking 130 km (81 mi) from the crash site, the location of the remains of the five airmen shows they had waited behind while the other three (Guy Shelley, "Rip" Ripslinger and Vernon Moore) set off north to try to find help. The body of S/Sgt Shelley was found 32 km (20 mi) away while 43 km (27 mi) further on were the remains of T/Sgt Ripslinger. The aircraft flew on a 150 degree course toward Benina Airfield. The craft radioed for a directional reading from the HF/DF station at Benina and received a reading of 330 degrees from Benina. The actions of the pilot in flying 440 miles into the desert, however, indicate the navigator probably took a reciprocal reading off the back of the radio directional loop antenna from a position beyond and south of Benina but 'on course'. The pilot flew into the desert, thinking he was still over the Mediterranean and on his way to Benina. After the Lady Be Good was identified, some parts of the plane were returned to the United States for evaluation while the rest of the wreckage remained. In August 1994, the remains of the craft were recovered by a team led by Dr. Fadel Ali Mohamed and taken to a Libyan military base in Tobruk for safekeeping. They are now stored at Jamal Abdelnasser Air Force Base, Libya. Over the years pieces of the plane were stripped by souvenir hunters. Today, parts can be seen at the National Museum of the United States Air Force. A propeller can be seen in front of the village hall in Lake Linden, the home of Robert E. LaMotte. The U.S. Army Quartermaster Museum at Fort Lee, Virginia has a collection of personal items, such as watches, silk survival maps, and flight clothing from the crew members who were recovered. Several of these items are on display. An altimeter and manifold pressure gauge were salvaged from the plane in 1963 by Airman Second Class Ron Pike and are on display at the March Field Air Museum just south of Riverside, CA. A Royal Air Force team visited the site in 1968 and hauled away components including an engine (later donated to the US Air Force) for evaluation by the McDonnell Douglas company. After some parts were salvaged from the Lady Be Good and technically evaluated, they were reused in other planes belonging to the American military. However, some planes that received these spares developed unexpected problems. A C-54, which had several autosyn transmitters from the Lady Be Good installed, had to throw cargo overboard to land safely because of propeller difficulties. A C-47 that received a radio receiver crashed into the Mediterranean. A U.S. Army de Havilland Canada DHC-3 Otter with an armrest from the bomber crashed in the Gulf of Sidra. Only a few traces of the plane washed ashore and one of these was the armrest from the Lady Be Good. A stained-glass window in the chapel at Wheelus Air Base commemorates Lady Be Good and her crew. "King Nine Will Not Return" is a 1960 episode of The Twilight Zone that told the story of a B-25 Mitchell crew member finding himself alone with the wreckage of his plane in the desert. In the episode, the marker on the grave of a member of the crew is dated "5 April 1943", the day on which Lady Be Good was lost. Although the wreckage of the King Nine shown in the production is a smaller and lighter B-25 medium bomber (specifically 42-32354), a newspaper picture in the episode is the actual Lady Be Good B-24 heavy bomber. The Flight of the Phoenix, a 1964 novel by Elleston Trevor about a group of oil workers who are forced to survive in a desert when their cargo plane crashes. The novel was the subject of a 1965 film and a 2004 film remake of the same name. Sole Survivor is a 1970 made-for-TV movie about the ghost crew of the Home Run, a B-25 Mitchell medium bomber that crashed in the Libyan desert. As a B-25, rather than the larger and longer ranged heavy bomber of the B-24 Liberator Lady Be Good, the plane in this film only made it 480 km (300 mi) inland. Wind, Sand and Stars, a 1939 autobiography by French aviator Antoine de Saint-Exupéry that details his survival following a 1935 plane crash in the Sahara Desert between Benghazi and Cairo. MM. 23881, an Italian Savoia-Marchetti SM.79 torpedo bomber which suffered a similar fate to Lady be Good in 1941 and was found in the Libyan Desert in 1960. Tragedy at Kufra, eleven South African Air Force personnel died from thirst and exposure in May 1942 after their flight of three Bristol Blenheims crash landed in the Sahara. Eastern Air Lines Flight 401, a Lockheed L-1011 that was similarly rumored to be cursed after parts from its remains were used in other aircraft. ^ In 1953, a British patrol on a desert-crossing exercise found human remains in the same area where those of Shelley and Ripslinger were later found. These were quickly photographed and buried on the spot. The patrol never asked for an investigation. In 2001, a member of the patrol recalled the incident and photographic forensic investigation of the remains concluded they had likely belonged to a male whose head may have been shaped like Moore's. However, both recovering these remains and making any meaningful identification is highly unlikely. ^ a b c d e f g h Vanishings! — "Lost in Libya", 2003, History International Channel, re-aired on March 1, 2010, 3:30 p.m. MST, and on September 6, 2010, 4:30 p.m. CST. ^ a b c d e f g Barker, Ralph (1988) [First edition published 1966]. "The Lady Be Good". Great Mysteries of the Air (Revised ed.). London, United Kingdom: Javelin. ISBN 0-7137-2063-8. ^ Martinez, Mario. Lady's Men: The Story of World War II's Mystery Bomber and Her Crew. Blue Jacket Books/Naval Institute Press. pp. 82–85. ^ a b "Lady be Good". www.ladybegood.com. Archived from the original on 12 September 2017. Retrieved 29 August 2017. ^ McClendon, Dennis E. (1962). Lady Be Good, Mystery Bomber of World War II. Aero Publishers. ^ a b ""Lady Be Good" B-24 Bomber, Quartermaster Graves Registration Search and Recovery". US Army Quartermaster Foundation. January 8, 2007. Archived from the original on February 25, 2010. Retrieved April 10, 2019. ^ a b ""Lady Be Good" > National Museum of the US Air Force™ > Display". www.nationalmuseum.af.mil. Retrieved 29 August 2017. ^ "'The Twilight Zone' King Nine Will Not Return (TV Episode 1960)". Internet Movie Database. Retrieved 29 August 2017. ^ "Sole Survivor (TV Movie 1970)". Retrieved 29 August 2017. Wikimedia Commons has media related to Lady Be Good (B-24 Liberator). This page was last edited on 15 April 2019, at 16:06 (UTC).